The summit with Xi comes as Kim and President Donald Trump are negotiating over the location for a second summit meeting, and would also come on Kim's 35th birthday on Tuesday. If Kim Jong Un is in China, it was be his fourth meet with Xi Jinping in the past year. North Korea leader Kim Jong Un is in China for a fourth summit meeting with President Xi Jinping, North Korean and Chinese state media reported Tuesday. 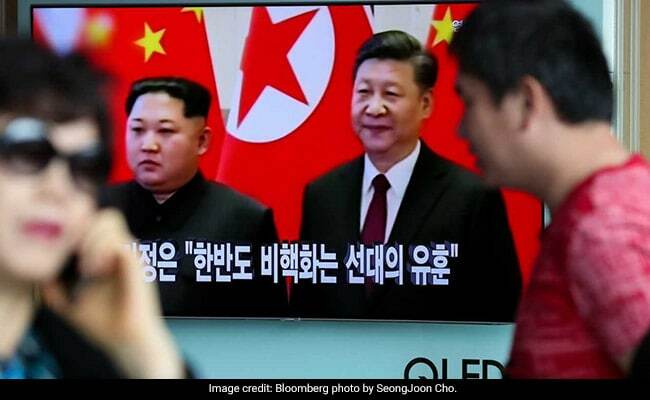 State-run Korea Central Television reported that Kim and his wife, Ri Sol Ju, are visiting China until Thursday, at Xi's invitation. Earlier, South Korea's Yonhap news agency reported that a North Korean train "possibly carrying a senior official" had crossed the border into China, passing through the Chinese border city of Dandong around 10:15 p.m., local time on Monday. Dozens of security vehicles and officials blocked the roads around the train station in Dandong before the train passed, Yonhap reported. The roads were reopened afterward. If Kim is in China, it would be the fourth time he has traveled there to meet Xi in the past year, with each of his previous visits occurring before or after holding summits with Trump or South Korean President Moon Jae-in. Kim is also expected to meet Moon again soon, possibly in Seoul. On Sunday, Trump told reporters negotiations were under way over a location for a second summit with Kim. And earlier in the week Trump said he had received a "great letter" from Kim. South Korean newspaper Munhwa Ilbo reported Monday that State Department officials recently met multiple times with North Korean counterparts in Hanoi to plan the summit, fueling speculation that Vietnam could host the event. "We are negotiating a location," Trump told reporters at the White House on Sunday. "It will be announced probably in the not-too-distant future," he said, according to the BBC. "They do want to meet and we want to meet and we'll see what happens." Trump said the United States had "a very good dialogue" with North Korea, adding that he had "indirectly spoken" with Kim. On his trip to China, Kim was also accompanied by senior officials including Vice Chairman of the Central Committee of the Workers Party Kim Yong Chol and senior diplomat Ri Yong Ho, according to Korea Central Television. The visit was also confirmed by China Central Television. Since emerging onto the world stage in the last year, Kim has mended previously strained ties with neighbor and key ally China, and made sure Xi has been kept in the loop. In his annual keynote New Year's Day speech, Kim also proposed "multi-party negotiations" should begin to turn the ceae-fire agreement which brought an end to the 1950-53 Korean War with a "peace mechanism" in order to "lay a lasting and substantial peace-keeping foundation." He also emphasized the significance of "strategic communication and cooperation" with socialist nations, highlighting his three visits to China during the past year. "Kim's mention of multilateral negotiations involving parties to the armistice agreement was directed at China," said Yang Moo-jin, a professor at the University of North Korean Studies in Seoul. "Kim is implying that China should be part of future talks on replacing the armistice with a peace treaty." In his speech, Kim said he would "sit down face to face" again with Trump at any time, adding he "will strive to produce an outcome welcomed by the international community." But he also warned that if the United States misjudges North Korean's patience, maintains sanctions and demands his country denuclearize unilaterally, he might be forced to explore a new path. On Sunday, Trump said sanctions would remain "in full force and effect" until the United States sees "very positive" results, according to the BBC. Kim's birthday, unlike those of his father and grandfather, is not celebrated as an official public holiday in North Korea, although in 2014 an exhibition basketball match was organized in Pyongyang in his honor, with former National Basketball Association player Dennis Rodman singing him "Happy Birthday."